Ships from our warehouse in 2 to 19 business days. I was a real fan of the Pact Magic mechanic when it came out in 3.5 so I was tickled to see it done in PF. Radiance House has done a very nice job with making a good adaptation and making it their own. There are some differences so be aware. First, the entities you bind to yourself are no longer called vestiges but spirits. Not sure why. Second, the goetia-based spirits from the original TOM are not to be found here which was the only disappointing thing for me. You have lots of spirits but they are all like they were once living creatures instead of the extreme creepy weirdness from the original TOM. I might have to convert the original vestiges to this system as I really liked them. Anyway, there is a lot to sink your teeth into here. Volume 2 is worth getting as well as it has options for classes found outside the core book and even utilizes character background rules from the Ultimate Campaign book. I'm looking forward to rolling an occultist (the new binder class) and seeing how they play. Looks like lots of fun! When I bought the "Tome of Magic" for D&D 3.5, I immediately fell in love with Pact Magic - I loved the concept, the great fluff...but power-wise, it came apart. With the notable exception of some minor supplemental material in certain Dragon-APs by Paizo, I never saw any supplemental material and if you're like me and have a LOT of books, that's a big drawback. 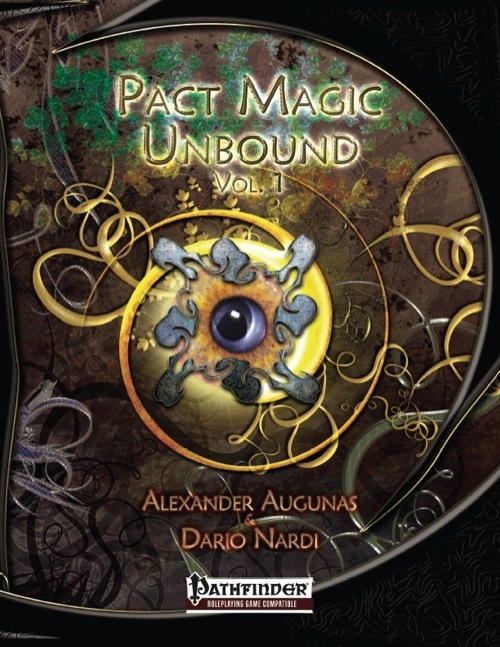 And then, when the now deceased Kobold Quarterly magazine featured a pact magic ad, I clicked on it and ordered the books in blind faith. And if there was ONE defining experience that still makes me check out unknown 3pps, it was this one: I got gorgeously-crafted, beautiful hardcover books for a very low price and they've seen a lot of use in my subsequent campaigns. With PFRPG, we now FINALLY get the update of my favorite magic system and it's more than just a cut-copy-paste-job - in fact, we get a completely new base-class, but for those of you not familiar with the concept, here's the spin: First, binding a spirit requires drawing a seal on a free 5-foot square - depending on the spirit, you'll have to draw the seal e.g. in darkness, with blood, etc. After drawing this symbol, you perform a ceremony, which is unique for each spirit and might range from the weird to the creepy. After witnessing the manifestation of the spirit, the binder barters with it: Each spirit comes with a binding DC that is compared to a binder's binding-check. Said check is d20+ 1/2 binder's level+cha-mod. You enter a pact with the spirit regardless of whether you succeed the check, but it does have consequences: For 24 hours, the binder shares soul and body with the entity and the check determines the amount of influence the spirit exercises over the binder. Successful checks indicate e.g. that the binder can suppress potentially weird physical signs that accompany entering a pact with a spirit. Also, the spirit's personality affects your behavior and you may ignore the spirit's restrictions like "not lying", gold as a top priority, short tempers etc. Now this system thus does not only provide a magic-system, it also provides a GLORIOUS role-playing catalyst. That out of the way, Pact Magic, fluff-wise, is also a somewhat scorned upon practice that brings out the fanatics in e.g. some clerics and has always carried the allure of the forbidden - after all, the practitioners channel spirits that are beyond mortality and often, the range of the gods. Thus, rules provided for hiding the physical signs etc. are provided. Since the forbidden aspect is partially based on an availability, other classes can wilder in the territory of Pact Magic - especially interesting for paladins, who can now vow oaths against spirits or become Templars of Spirits, who may smite those bound as well as evil and perform exorcisms. Clerics may become occult priests, take the occult domain and even worship spirits now - though whether sanctioned or as a heresy depends on your world. Oh, detecting heretics is supplemented by 3 new spells. Pactsworn Pagan-druids modify their shape to be more pleasing to the spirit and pay for their binding with diminished spellcasting, while the monks of the empyrean friar blends martial arts with being possessed by spirits and their supernatural abilities - I had a similar character in one of my campaigns once and it rocked, so cool concept! And yes, even fighter may opt to become so-called warshades and benefit from pact magic. Rangers get a new archetype to gain some limited pact magic-associated abilities, while rogues may select new talents to hide supernatural aspects, improve capabilities of spirits or play an untouchable, who always gets the short end of the stick, bargain-wise, but apply a skill-bonus to a whole attribute's array. Sorcerors may chose the Ergon bloodline that has tumor-like, eye-resembling growths spawn on the body and work as eyes as well as the power to devour magic and transcend into a half-construct as per the ARG. The second bloodline, the ravaged, is closer to a more conventional pact magic/sorceror blending. Wizards may opt to take the new soul weaver archetype, who have their spellcasting prowess diminished and forsake 3 schools, but may in turn fuse pact magic and regular magic by e.g. sacrificing prepared spells into granted abilities for more flexibility. Barbarians may become totemic sages (and also get 2 rage powers) and bards soul muses. Bards also benefit from a new masterpiece to daze foes. You may have noticed some confusing terms here, so let me elaborate: A spirit's write-up takes up at least 1 page and not for no reason - each spirit has totems, mementos that remind him/her/it of its former life that grant the binding character a +2 insight bonus on binding checks when present, +4 when all are present - researching these can, again, be a great roleplaying opportunity. The aforementioned ceremonies can be rushed, but that makes the result be more prone to being unfavorable for the binder. Binding spirits has multiple benefits: First of which would be minor benefits - and plural is appropriate indeed - for each spirit has at least a couple of these benefits. They range from permanent boons while being bound to the spirit to abilities that can be used 1/character level to some that have a cool-down of a couple of rounds, but no other restriction. Major abilities are simply the stronger ones granted by the spirit. Beyond these, each spirit has a capstone empowerment, which only becomes available to the binder if he/she succeeds at the binding check by 10 or more, making even low-level spirits bring something new to the table. All spirits also are aligned to one of 13 eldritch constellations and almost all of aforementioned archetypes are limited in their constellation choices. Each spirit has a favored enemy and ally constellation (sometimes multiple) that can be further enhanced by feats and makes binding spirits to allied races easier/harder, respectively. Furthermore, each constellation has 4 different potential constellation benefits. Now, the binders may also opt to forego a minor ability to instead gain the service of a so-called vestigial companion (after vestiges, the name originally applied to the spirits). The spirits also are grouped by levels from 1st to 9th, following in that regard the traditional presentation. Now, it should come as no surprise that we also get a full binding class, the Occultist, who gets 3/4 BAB-progression, d8, 4+Int skills per level, and bind multiple aspects and squeeze augmentation bonuses out of their spirits. But what are these spirits? Well, for example, you could bind Cave Mother, she who discovered fire, General Hessant, the Patron of Lost Soldiers, a tall story come to life by enough people believing in it, N'alyia, the First Vampire, the first of the otyughs, a living curse, Loh'Moi the geometer that sought to think 4-dimensional by teleporting into his brain, ultimately to turn back time, famed Dagon (Yes, mythos-aficionados - one constellation is called Dark beyond...), a psychotic elven princess turned black unicorn, a king betrayed by any and all as well as the sworn enemy of time. And no, that were not all contained herein. A total of 20 feats are also part of the deal to expand the options of your pact magic-casters. Interesting is also that multiple models of spirits-known are presented for the DM, putting control essentially in your hands while featuring guidelines that help maintaining balance easy. Editing and formatting are very good, though I noticed some minor typo-style glitches, I encountered very few and far-between, so nothing to truly complain about here. Layout adheres to a b/w-2-column standard with many of the artworks of the 3.5-version and one artwork for each seal. The pdf comes fully bookmarked, but sans nested bookmarks. In the original, EVERY spirit had a legend, an expertly-written, sometimes, creepy, sometimes tragic, sometimes philosophic, but never boring history spanning a whole page as well as a cliff-notes version for the DM. While multiple of the spirits have retained their legends in this book, there also are several that have been omitted - for example the disturbing legend of evening star. The PFRPG-mechanics are awesome (and I hope, we'll get APG, UM and UC-support in Vol. II), the omission of the legends/cutting them down to mere paragraphs may conserve page-count, but it also detracts from what made pact magic stand out in my mind - not necessarily the mechanics, but the storytelling. The AWESOME flavor that made Pact Magic feel much more magical than regular magic. Don't get me wrong - this is still a great offering. Its crunch is actually better, getting rid of alignment-changes etc. On the fluff-side, though, it just isn't as brilliant, as mind-boggling in its fluff as its previous incarnation and I really hope Vol. II will come with ALL legends - for more than anything else, more than the solid mechanics, it's always been the stories that, for me, defined Pact Magic. Due to this factor, I will settle for a final verdict of 4 stars + seal of approval, for the rules are awesome - but the cut legends and the useful cliff-notes make this pdf suffer a bit. If you can, somehow hunt down the 3.5-books as well - they are worth every cent and having legends for ALL spirits makes them so much cooler. Back around the time the Pathfinder RPG first came out, I saw some posts about a 3rd party version of Wizards of the Coast's Binder from Tome of Magic. I'd seen a number of people say that the Binder had some good ideas, but had some mechanical problems. 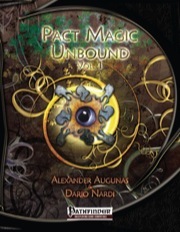 The general consensus was that this 3rd party publication "Secrets of Pact Magic" was 'the binder, done right'. Now, the authors of Secrets of Pact Magic have updated their book to the Pathfinder RPG. This isn't just a quick and dirty conversion, the authors have taken advantage of the innovations introduced by PFRPG to make their Pact Magic book blend seamlessly with the overall system. It's a very elegant and professionally put together system and there is something in here for pretty much every game whether or not you decide to use the new class added by this book or if you want to use an archetype for an existing class. Bottom line, this comes highly recommended and I hope to see more such material from Radiance House. Fantastic, thanks again for all your help and answers! I agree that Exorcise Spirits should not be usable on yourself (as allowing that makes Expel Spirits effectively unnecessary) - if you're planning errata, that's a great one to get in there. I'll note your intent in the handbook. I do however like the Poltergeist->Exorcise combo as an alternative expulsion method since that takes much longer and has higher prerequisites. - The Occultist is likely to already have one very strong minion in the form of a spirit's vestigial companion. You can get some pretty powerful ones already, such as scaling dire animals from N'alyia and Vodavox, Portentos' awakened companion, and in particular Loh'moi's Eidolon (even at half evolution points, he is going to be a pretty tough customer the Occultist can hide behind.) And I haven't even finished looking through all the great new options in volume 2. And these too have the same advantage of a spirit's powers in addition to their strong physical forms. So an Occultist, even a frail caster version, is going to be difficult enough to corner in melee past mid-levels with just one poltergeist and a companion out; with 3 poltergeists and a companion they're going to be next to impossible to place in danger unless they are significantly outgunned. They can even animate an object like a giant cage or a wagon and ride around in it, safe from many forms of attack. I'm perfectly fine with this strategy and indeed it could be a lot of fun, I'm just not certain allowing more than one poltergeist at a time is needed. My current gut feeling is to make the pact poltergeist count as a vestigial companion; as in if you have a pact poltergeist, you can't have a companion from another spirit. It basically functions as a vestigial companion as written anyway. That would do it - and in fact, it would give a great VC option to spirits that either don't have one at all (e.g. Demos, Jayna), don't have one they can share powers with (Hessant, Sylvus) or don't have a very strong one (Gulguthriana, Xalen etc.) I do like the idea of having one "companion slot" and one "poltergeist slot" though. Maybe if the poltergeist was limited to Large or Huge size? Or they could get back companion + poltergeist with a feat? I dunno. Any idea of when this wil come off backorder? Basically, Dario and I have been focused on getting Volume Two to Paizo for the past month or so, and if you've kept up with its product thread you'll know all about the crazy printing issues we've been struggling with regarding Vol 2. Volume 1 went into Backorder sometime during that process and we weren't able to print new copies of it. When we finally got Volume Two squared away (about two weeks ago), Dario and I decided that we didn't want to reprint Volume 1 until we were able to clean up its text some with an errata and FAQ document. That's been my primary objective for the past two weeks or so; its taken so long because I'm an east coaster and am constantly losing power thanks to the record-breaking snowfall we've been getting this year. So in sort, its on the table but I don't know when it'll be in the warehouse. I'll keep all interested parties posted! SO if I buy the bundle now does that mean I'll get the current PDF and the new reprint when it does eventually happen? I'm more than happy to subsist on the pdf in the meantime, but having a dead tree copy always appeals to me more. If you buy the bundle now, you'll get the print book shipped to you when it arrives in stock and the PDF immediately. When we update the PDF, you'll receive an e-mail from Paizo telling you that we've updated it and you will immediately be able to download a fresh copy. I'm also planning on having the errata readily available to those who don't want to kill more trees. But I totally hear you on having a print copy. I haven't used Volume 2 in my home games yet because I don't have a print copy, and I wrote the bloody thing! Definitely liking what I'm reading in the book, still working my way through the spirits in the back. For those who have used the Occultist class, how does the power level stack up with the normal PF classes? I'm putting together material for a new campaign, and I know this just needs to be in there. Looking for advice for things to be wary of, as we do have the obligatory player with the Enhanced Powergaming feat. At the very least, I'm looking at the Occultist, adding the new domain for clerics, and the Paladin archetype. Pact Magic as a whole is balanced around being a long-term game. You can't run out of occult powers, but you can't really nova with them either. As a result, most of the optimized in my group don't even consider the pact magic classes, but your mileage may vary. As another general rule, it's the core/base class archetypes that are more often used for optimizing than the occultist itself. Thanks for supporting our book, nevertheless! OK, good to know. Volume 2 has made it from sidecart to this month's order, so it should be shipping out to me soon. Reading reviews of the prior OGL versions, it sounds like some of the spirit stories didn't make it into the product versions (guessing for space reasons). Is there any chance of those becoming a PDF download? I'm aiming for a "pact magic is rare" campaign, and the spirit backgrounds seem like they could be useful to provide some details as an occultist locates lore on spirits. 100% chance. Dario Nardi, my co-author, is working on a product called Six-X-Six, which is an anthology of every occult story he's ever written, as well as two new ones. Those legends will act as previews for two new spirits that will be detailed in Volume 3. Before that, however, I have Dario busy triple checking my errata for Volume One so we can get the book back in stock at Paizo. In the New Spells sidebar in Chapter One, the text for Last Impression has a sentence that goes, "You experience this information in real time, suchYou only gain information that the creature possessed, so if it was stabbed from behind, never seeing its attacker, then this spell does not reveal who the attack was to you." I'm...not entirely certain as to what the first part was supposed to be in full? And I also presume that it should be 'attacker', not 'attack'. Edit: I belatedly note the spell was fixed for Vol. 2, though. Less an error than a quibble with wording, in Pact Magic is Scarce subsection under How Many Spirits Do I Know?, I feel, "gains no additional spirits knowledge when leveling up," is a bit unwieldy; might I suggest, "gains no knowledge of additional spirits when leveling up," instead? And for a quite nitpicky detail, Aza'anti's physical sign says that onlookers perceive you as being much younger then you actually are...which should be than. Minor thing, Mute Sylvus' manifestation reads, "You feel a cold gaze upon you before suddenly experiencing flashes of the terror and panic that Sylvus and his sons felt before returning to realty." Should be reality. Another nitpicky error, Tyrant Cromwell's physical sign says, "Your gain blond hair and blue eyes," which should be You. In Hexus' vestigial companion section, it read, "See the monster’s entry in see the monster’s entry in Pathfinder Roleplaying Game Bestiary." Noted a few typos in Dark Blood's legend: "According to the legend, there once was youth who was drafted into the great armies of the hobgoblins." Should be 'a youth', I presume. "They ultimately failed, though it unclear why." Should be 'it is unclear', I believe. Jayna has listed as a favored enemy Elemental (any); the Elemental type doesn't exist in Pathfinder, and is now a subtype, so it should likely be Outsider (elemental). Also relatedly to Jayna, this is probably the nitpickiest nitpick, but I feel like, an array automatically makes whatever follows plural, so it ought to be, "an array of elemental powers". Thanks for reviewing us, eggplantman! Why did we change the name from vestiges to spirits? You can't copyright game mechanics terms (like rolling dice or "binding checks" or whatnot. You can't copyright "pact magic," as it is based on real-world geotian magic and was written about over 70 years ago, placing it into the common domain of copyright law. You can copyright the term "vestige" as it pertains to pact magic because it is a specific term. By changing the name from a specific term to a general term, we avoid copyright infringement on the original designers of Pact Magic. Why did we drop the geotia-based spirits? Because its more fun to invent new ideas then to rehash old. Plus I really want to cover those spirits as actual demons rather than "vestiges" in the future. I agree that the rich beliefs behind Solomen the King and his 72 Demons are awesome, but I'd be more likely to convert the entire mythology rather than simply snip bits and pieces of it around. Happy to do so! Really enjoy the products and the effort put into them. I do miss the goetian spirits though I see that yours are a little more approachable while the goetian ones from ToM are quite monstrous. If you ever come up with a supplement that tackles them as spirits, please let me know. I announced this in our Pact Magic Facebook group a few months ago, so I guess there's no harm in saying it here on Paizo. We are NOT doing a Volume 3. Here's all of the information that you need. Since the Goetia all have their ranks and legions in Hell, may I suggest that they're not really vestiges/spirits in the standard sense, but rather simply infernal dukes who've been given the power to emulate being pact spirits, so as to gain eyes and ears on the world and maybe do a little temptation on the side? I have plans to make it work flavor-wise, but they won't be happening for a good while. And a side issue, if I may: We now have a complete set of constellations for Golarion, both hemispheres and a zodiac ring. Which do you think Golarionian occultists would assign to the pact constellations? Would they go with the 13 signs of the Cosmic Caravan zodiac, or branch out further? Cosmic Caravan: The 13 signs of the Cosmic Caravan offer portents to Varisians and astrologers alike. Below are the astrological signs and their corresponding dates. The Thrush (18 Kuthona–20 Abadius): This curious bird heralds the coming of the travelers, its wings spread wide. The Lantern Bearer (21 Abadius–16 Calistril): Guiding the caravan past danger and monotony, this serpentine angel lights the way with the torch of inspiration. The Newlyweds (17 Calistril–11 Pharast): Slipping away for privacy, this couple—represented by a pair of intertwined bodies or scarves—embodies devotion and new life. The Bridge (12 Pharast–18 Gozan): A span across danger, this constellation carries the travelers to new adventures and separates the dark of winter from the light of summer. The Daughter (19 Gozan–13 Desnus): This light-hearted dancer is the first to cross the Bridge, skipping into the warm days of spring, filling them with joy and song. The Rider (14 Desnus–20 Sarenith): This stern barbarian and his painted mount watch over the caravan, sometimes a boisterous companion, other times a solemn warden. The Patriarch (21 Sarenith–20 Erastus): The father of the wanderers reliably steers the Wagon through danger. The Wagon (21 Erastus–10 Arodus): The vehicle that conveys the travelers through the sky, represented as a seven-armed wheel or star. The Pack (11 Arodus–16 Rova): The beasts that follow the Wagon, either dutiful hounds or scavenging wolves. The Mother (17 Rova–30 Lamashan): Depicted as a cauldron over a warm fire, the spiritual heart of the caravan shares her bounty of food and comfort to stave off the coming chill. The Stargazer (31 Lamashan–20 Neth): Either a prophet or a fool, this robed traveler casts his gaze ever toward what lies beyond, searching for either new wonders or treasures lost. The Stranger (21 Neth–29 Neth): A f leeting companion to the wanderers, this outsider passes through their lives on his own journeys, and is represented by a single staring eye. The Follower (30 Neth–17 Kuthona): Trailing behind the travelers and only seen on the darkest of nights, this veiled figure waits at the end of every journey—the constant companion, Death himself. The Stirge: Whose nose got stuck in the sky. The Stair of Stars: The pathway that leads the faithful to Desna's palace of Cynosure (the North Star). The Sea Wraith: The vessel of Besmara, the Pirate Queen. The Hawk: Who hunts the heavens and defends the sun. The Key: Which Abadar made to unlock the First Vault. The Sorcerer: Who spellcasters look to for guidance. Gigas Major: The old giant. Gigas Minor: The young giant. The Gecko: Who climbed up to the sky. The Ferryman: Who claims lost souls. The Sphinx: Who knows many secret things, and whom even the gods respect. The Fang: That vampires kill for. The Kraken: Who ensnares Ardacondis. The Tarrasque: Who sleeps among the stars for now, but will return when the time comes to end the world. The Throne: Reserved for the final king.